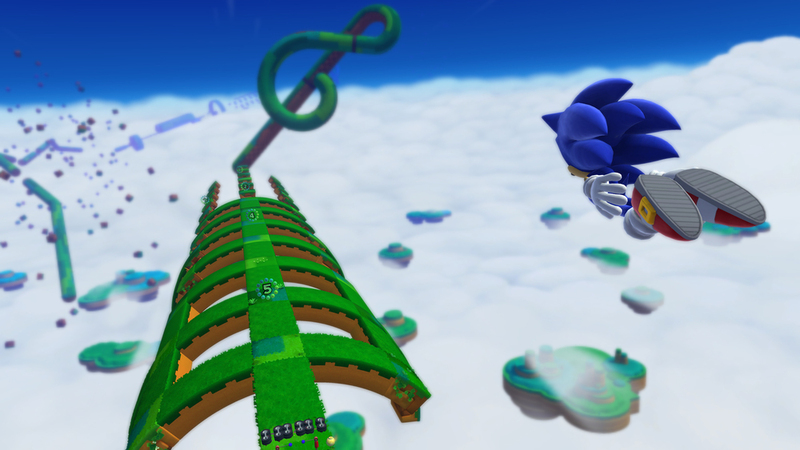 In Sonic Lost World, Sonic will walk unless you hold the run button. I saw the benefits of this control scheme as early as the first zone. Navigating the game's first pill-shaped planetoid suspended in space, I had a number of options for moving forward. I could walk forward, where enemies awaited; a more careful step would be diligent when facing foes. Or, I could scramble to the top of a nearby platform, where I'd find a thin, straight path clear of obstruction and perfect for running. Here, if you can explore a set of criss-crossing paths in the correct order, you'll find a series of items building up to a 1-up. The lower path worked well with a slow-paced walking Sonic. Enemies are by no means rocket science in Sonic Lost World, but each has distinct behavior, and it's fun figuring out how to deal with them and doing so properly. A direct homing attack is fine for taking out robotic piranhas, but spiked caterpillars will scatter their sharp bits unless you use Sonic's kick attack. These two methods of attack come with their own competing strengths, as well; the homing attack can lock onto six enemies at once, but you can use a kick to send one enemy into another. I had fun just experimenting with different ways to tackle enemies. And the fast path moved at a satisfying clip, with Sonic rushing forward. While running, Sonic can also run up walls or along their sides. The ability to run up walls is a convenient, often life-saving tactic; if you see yourself landing just short of a jump, hold the run button, and Sonic will boost up the cliffside. The wall run in action. The camera will never face this direction, though; it always faces forward, where Sonic is running towards. Running along the side of a wall (that is, parallel to its top rather than perpendicular), on the other hand, is an advanced tactic that may seem finicky until you learn how to work the joystick properly. It will provide access to particularly rewarding paths if you can master it. During one memorable stretch, I used the wall run to grab some rings over a bed of spikes. And even though each path had a distinct mood, they weren't totally disconnected. With some clever platforming, I could find my way up to the speedy path at certain points later on. By the same token, if I was on the top path and lost my footing, I'd land on the harder, slower path. Sonic gets development, but this guy only has one character trait. Can you guess what that is? Between stages, cutscenes developed a story beyond simple fun. Sonic's got some flaws, it seems, and while they are predictable, Sonic Lost World gives its stars room to chew the scenery. Sonic, Tails and Eggman get plenty of banter with each other, enough so that their relationships don't seem black and white. On the other hand, your alien rivals—the Deadly Six—don't develop past whatever cliche they're assigned. But these complex, layered stages were the minority in Sonic Lost World. Most turned to some platforming gimmick or other. In one 2D platforming stage, Sonic had to race forward to stay ahead of disappearing blocks. I lost my footing a few times, only to be saved by a wall run. Or, there was the 3D stage where Sonic was wrapped inside a giant snowball; here, holding the run button helped me blaze over daring jumps while I took it slowly when rolling over thin bridges. These stages may not have held much potential for exploration, but they did flesh out Lost World's control scheme while providing entertaining single-level ideas. Speaking of gimmicks, Color powerups will appear from time to time and provide a change in gameplay. Sometimes, they stuck to the core of a zone's theme, like the Rhythm powerup, which asked me to touch certain spots on the gamepad to follow a trail of notes. This helped me to evade a spotlight that had tracked me throughout the zone. Other times, they provided an aside, like the Drill powerup that let me explore the treasure-laden waterways beneath a beautiful beach. 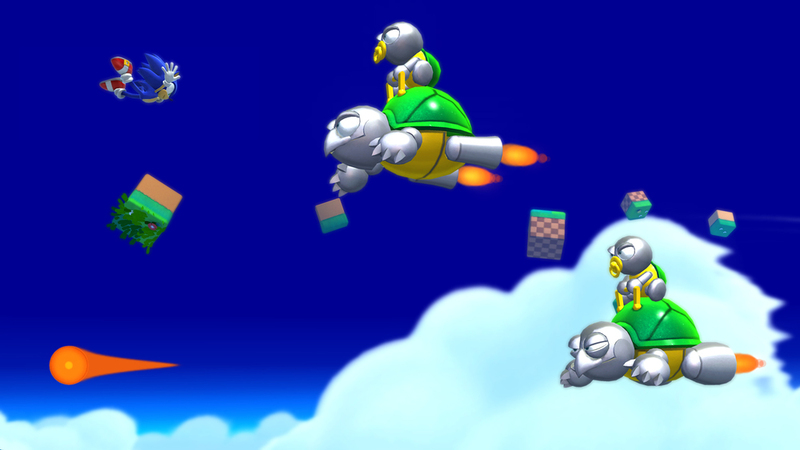 In one gimmick stage, Sonic flies, and you curl up to adjust altitude as well as damage enemies. This screenshot also shows off the cutesy-lookin' badniks you'll face in Lost World. This sense of frilly, fun gameplay works well with Sonic Lost World's visual style, which often favored bright, cheery, animated elements. The fourth world is a winter wonderland, and at night, bright background lights reminded me of winter holidays. Enemies will often have big, beady eyes with exaggerated, goofy proportions in their bodies. When there was exploration to be had, the game hid precious but optional Red Rings to uncover. Sometimes, a Red Ring would taunt me from some impossible location, and I could only reach it through experimentation with wall running. Though wall running is dense and overly complicated for what it is, the game does take steps to teach it to the player. It does so through gameplay and stage design rather than ham-fisted tutorials. Admittedly, sometimes that stage design is obtuse and hard to understand. Patience also became key to handling bosses. Every other stage holds a boss, and while you can lay it on them as quickly as possible, it's more prudent to wait for the proper moment to strike. Most bosses will die to two perfectly-placed hits, making battles gratifyingly speedy so long as you can do it right. After knocking the first boss off of his crazy-faced moon, you can tackle him immediately for piddly damage, or you can build up a lock-on to land a heavy blow. And you'll need both practice and patience to make it through Sonic Lost World's final stretch. Near the end, one particularly thrilling moment had me running between two walls suspended over lava as a giant cannon fired at me. Granted, I could have also used a Color powerup to skip this section entirely. The stage before had a harrowing sequence of rails to grind, pushing my skills with Sonic's jumping abilities. But not all development in Sonic Lost World reaches a satisfying conclusion. Sonic's character development in the story is stunted at the end, leaving me to wonder what the whole thing was about. Exploration also failed to develop, always sticking to a predictable sense of paths; stay high for difficult platforming, go low to find dangerous secrets, and stick to the middle for an easy time. Lost World provides a good time, just not a robust one. Sonic Lost World has a control scheme with great potential and, when it wants, a firm grasp on exploration. Unfortunately, trying to pull off Sonic's more advanced techniques can bring confusion, and exploration is more often than not traded out for a shallow one-shot level idea. That said, the new control scheme also allows for more lenient and accessible platforming, giving room for players to learn, and level gimmicks are always fun even if they are simple.